Meet your lunch plans. 🙂 Healthy whole30 Thai noodle salad with chicken, “peanut” sauce, and kale. An easy family friendly meal, serve hot or cold! 1 tablespoon lime juice fresh squeezed is best! In a blender (or food processor) puree all ingredients for the sauce until creamy and smooth. Place the zucchini noodles on a baking tray and cook in a convection toaster (or oven) on 450F for about 10-15 minutes until soft. Then set aside. *You can also cook them in a skillet on the stovetop or steam them, but I have found that convection baking the noodles turns out perfect results every time and eliminates excess water! Be sure to drain excess water from the noodles after cooking! Nutrition Facts Whole30 Thai Chicken Noodles Amount Per Serving Calories 542 Calories from Fat 288 % Daily Value* Total Fat 32g 49% Saturated Fat 6g 30% Polyunsaturated Fat 3g Monounsaturated Fat 7g Cholesterol 56mg 19% Sodium 659mg 27% Potassium 350mg 10% Total Carbohydrates 30g 10% Dietary Fiber 12g 48% Sugars 10g Protein 32g 64% Vitamin A 373% Vitamin C 390% Calcium 36% Iron 34% * Percent Daily Values are based on a 2000 calorie diet. 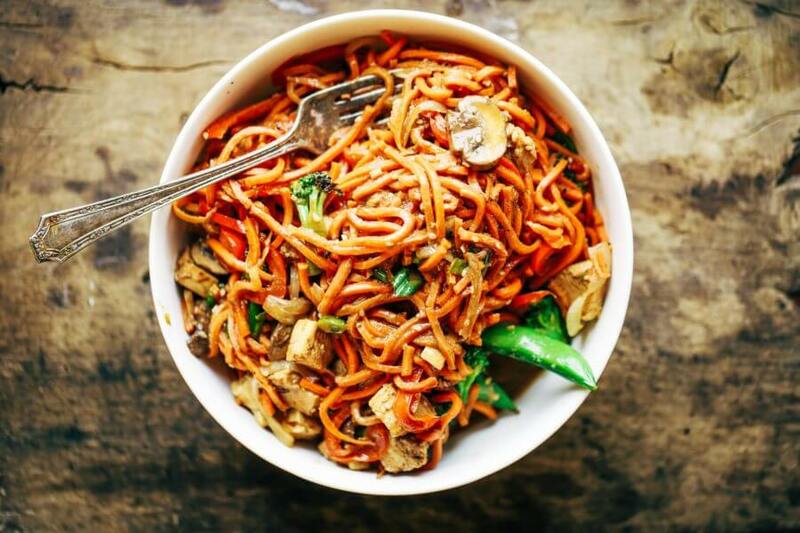 Healthy Lo Mein made with delicious carrot noodles! An Easy 15 minute whole30 meal the whole family will enjoy! 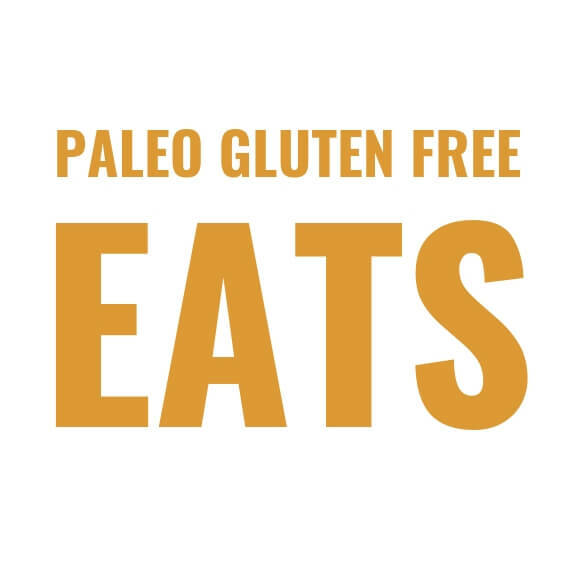 Grain free, paleo, gluten free. Place the carrot noodles on a baking tray and cook in a convection toaster (or oven) on 450F for about 10-15 minutes until soft. Then set aside. *You can also cook them in a skillet on the stovetop instead, but I have found that convection baking the noodles turns out perfect results every time and eliminates excess water! 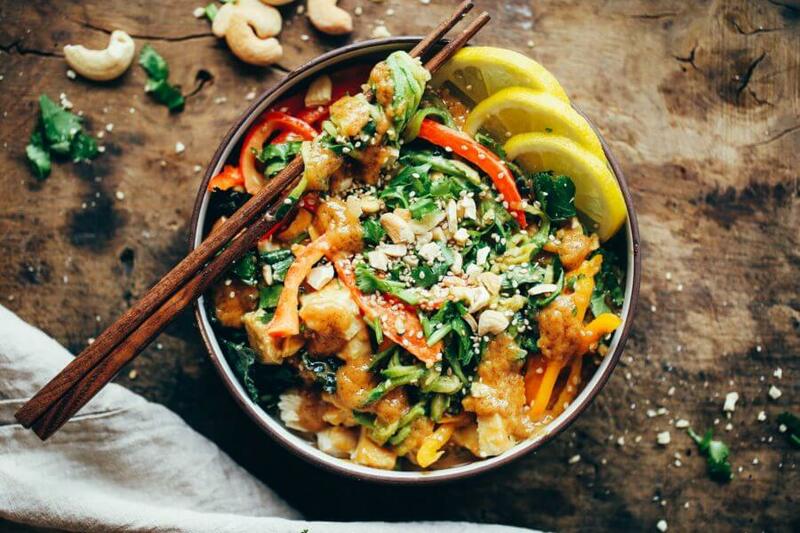 In a frying pan, lightly saute the vegetables in 1-2 tablespoons sesame oil or water. Cook for about 5 minutes until soft (but not mushy). Then set aside. In a mason jar or hand blender puree ingredients for the sauce. Thicken sauce over medium heat in a sauce pan or skillet, stirring consistently with a whisk, until the sauce thickens and is smooth. Do not over cook the sauce otherwise it will become too thick! If this happens, just add more water. In a serving bowl, add the noodles, vegetables, cooked chicken, and pour the sauce over top. Serve with sesame seeds and chopped green onion. Nutrition Facts Best Whole30 Chicken Lo Mein Amount Per Serving Calories 343 Calories from Fat 108 % Daily Value* Total Fat 12g 18% Saturated Fat 3g 15% Polyunsaturated Fat 1g Monounsaturated Fat 2g Cholesterol 49mg 16% Sodium 925mg 39% Potassium 554mg 16% Total Carbohydrates 34g 11% Dietary Fiber 10g 40% Sugars 5g Protein 25g 50% Vitamin A 175% Vitamin C 213% Calcium 9% Iron 21% * Percent Daily Values are based on a 2000 calorie diet. Meet your dinner plans. 🙂 Creamy whole30 chicken, broccoli, cauliflower rice casserole. Your family is going to love this warm and comforting casserole! 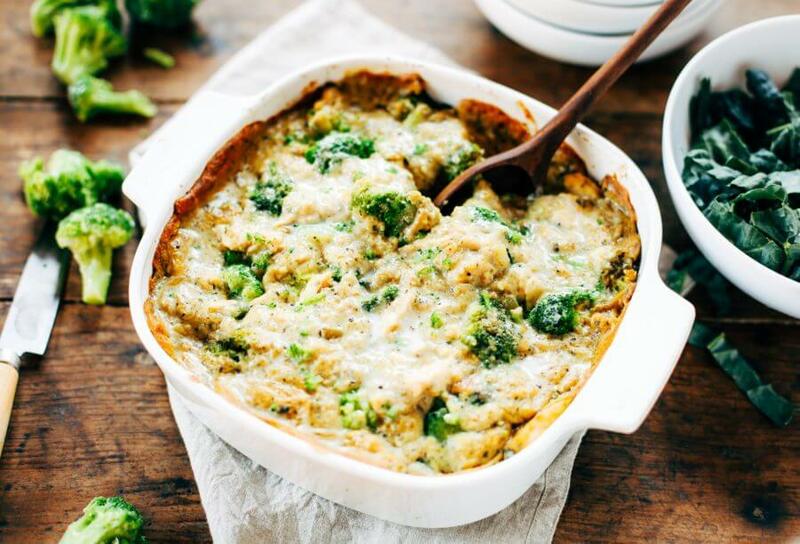 Kid proof and stuffed with three veggies, topped with the best herb cream sauce. Preheat oven to 400F. Generously grease a 9" by 9" casserole pan with avocado oil (or olive oil). layer in the cauliflower rice, broccoli, chicken, and green chiles into the pan. In a medium sauce pan whisk together all the sauce ingredients, except the egg and tapioca flour. Bring to a boil, then reduce to a simmer. In a cup, whisk the egg and pour into the sauce while stirring continuously. The sauce will begin to thicken, continue to stir to avoid clumping. Next whisk in the tapioca flour and continue to simmer and whisk for about 1 minute until the sauce thickens and all the clumps are beaten out. Be careful to take it off the heat as soon as it starts to thicken, otherwise it will become too thick. Then pour the sauce over the casserole and bake on 400F for 45 minutes until the edges are browned. Nutrition Facts Chicken Broccoli Cauliflower Rice Casserole Amount Per Serving Calories 455 Calories from Fat 189 % Daily Value* Total Fat 21g 32% Saturated Fat 14g 70% Polyunsaturated Fat 1g Monounsaturated Fat 3g Cholesterol 96mg 32% Sodium 894mg 37% Potassium 348mg 10% Total Carbohydrates 27g 9% Dietary Fiber 8g 32% Sugars 7g Protein 36g 72% Vitamin A 71% Vitamin C 244% Calcium 11% Iron 23% * Percent Daily Values are based on a 2000 calorie diet. 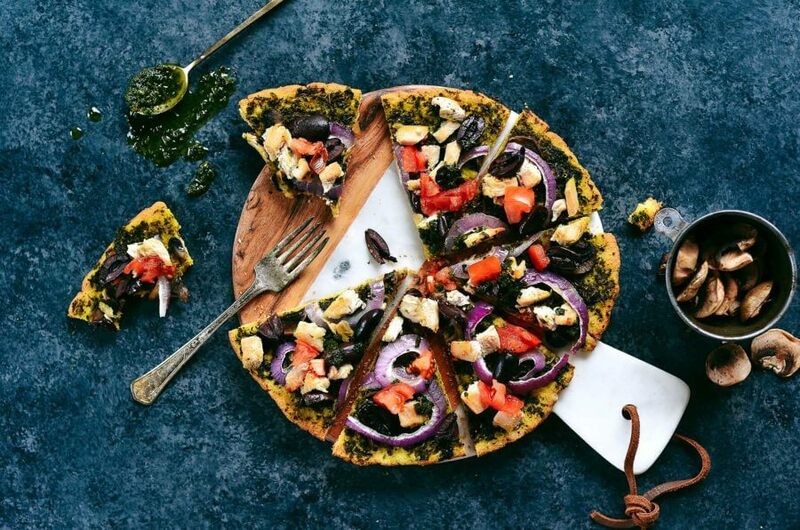 Quick and easy paleo pizza with delicious Mediterranean toppings! Healthy low carb garlic herb crust topped with chicken breast, dairy free basil pesto, kalamata olives, mushrooms, and red onion. Mmmmm:) 100% gluten free and lip smacking good! 1/3 cup kalamata olives Cut in halves. 3-4 whole white mushrooms Sliced. 1/4 cup red onion Sliced. 1 tablespoon olive oil For drizzling on top. basil olive oil pesto For sprinkling on top after cooked- If desired. In a medium mixing bowl or KitchenAid, combine all the ingredients for the crust. Roll the crust out on a pieces of parchment paper. Then transfer the pizza on the parchment paper onto a pizza or baking dish. Brush the olive oil over the pizza crust, followed by the pesto. Layer on the chopped mushrooms, onions, olives, and chicken breast. Bake on 400F for about 20 minutes. Once the pizza has cooked you can opt to drizzle on more olive oil and pesto if you want. Nutrition Facts Thin Crust Chicken Pesto Paleo Pizza Amount Per Serving Calories 274 Calories from Fat 153 % Daily Value* Total Fat 17g 26% Saturated Fat 4g 20% Polyunsaturated Fat 1g Monounsaturated Fat 8g Cholesterol 12mg 4% Sodium 555mg 23% Potassium 84mg 2% Total Carbohydrates 25g 8% Dietary Fiber 8g 32% Sugars 1g Protein 8g 16% Vitamin A 2% Vitamin C 3% Calcium 8% Iron 7% * Percent Daily Values are based on a 2000 calorie diet.